Although the charitable sector achieved many successes in 2013—providing testimony on Capitol Hill, securing bipartisan support for the charitable deduction, and mobilizing a grassroots effort conducting hundreds of meetings with lawmakers—threats to private charitable giving still remain. Tax reform will continue to be a point of interest in 2014 as the tax-writing committees prepare for change. The Senate Finance Committee will have a new Chairman earlier than anticipated. The House Ways and Means Committee may also be looking at new leadership after 2014. And of course it is also an election year. With many tax issues still undecided, nothing is completely on or off the table. This is not the time for the philanthropic community to stay on the sidelines. Join us to learn about what we can do to protect private giving and educate lawmakers about the critical role of charitable organizations in a free society. Registration: To register for the ACR Summit as well as other events of Philanthropy Week in Washington, click here. With a change in leadership of the Senate Finance Committee and the prospect of new leadership for House Ways and Means in 2015, this is likely to be a “staging year” for tax reform. As issues of income inequality and economic mobility take center stage, Congressional staff will provide an insider’s look at the legislative landscape on Capitol Hill for 2014 and what issues could impact the philanthropic community. Four charitable leaders from diverse organizations will discuss how best to communicate with policymakers on behalf of the charitable sector. Models for successful communication include political and philosophical messaging about serving the most vulnerable in our communities, the economic impact of nonprofit programs, the leveraging of charitable donations, the role of volunteers, and the critical importance of pluralism and philanthropic freedom in a democracy. Tax deductions and credits attracted increased attention during federal and state tax reform conversations in 2013 as policymakers chased lower rates and/or increased revenue. As the charitable sector seeks new allies in its efforts to protect private giving incentives, we need to understand the broad appeal of the argument for lower rates before we can relay an effective message about the financial, political, and social value of private charitable giving. Our panelists will offer two perspectives on tax reform and the value of private giving incentives like the charitable deduction. Howard Husock, vice president for policy research, Manhattan Institute (also Forbes contributor). Click here to see our interview with Husock from December 2013. If you plan on meeting with members of Congress during your time in the nation’s capital, watch this video of former congressional staffers offering their advice on what you should know. The ACR Summit for Leaders will be part of the programming of Foundations on the Hill (FOTH), an annual opportunity for grantmakers and regional associations to meet with their federal lawmakers in Washington, D.C. 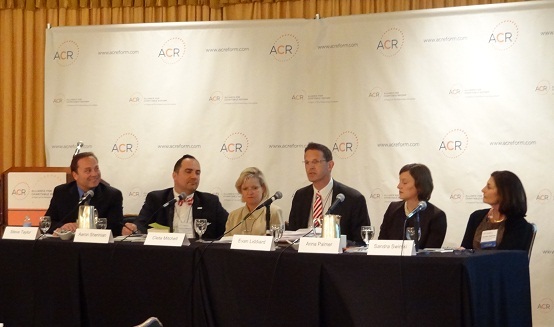 The ACR Summit for Leaders and FOTH are two of the events of “Philanthropy Week in Washington“–a week of activities themed around engaging policy makers in the nation’s capital. Day one of meetings with members of Congress. Day two of meetings with members of Congress. Lunch will be provided on Capitol Hill. Visit www.foundationsonthehill.org for a full FOTH agenda and to learn more. Participants – The ACR Summit for Leaders is open to representatives of foundations and nonprofit organizations. Participation in FOTH is limited to IRS recognized foundations and corporate giving programs.